Music was supposed to be running like water by now. Alongside the hot and cold taps, or perhaps just next to some electrical plug sockets, would be the music switch perfect for 21st century domestic consumption. Just flick it and out would flow the ideal musical accompaniment for your day to day drudgery or delectation. Perhaps that's what we have now anyway? Whether we like it or not, music is an omnipresent soundtrack. It's in our banks, airports, shopping centres, everywhere humans amass there's music parping and tinkling and clanging away. Soon it'll beam up at us from concrete pavements as our feet hit the kerb. Music is here to ease our passage through commerce and corporate structures. It is a marketing device with which to cloak a business opportunity. Music needs to become special and desirable once again, hence the deification of boutique vinyl editions complete with specially commissioned artwork and micro-availability. It's a reasonable response to the glut of synthetic strings and drums flooding from permanently networked global check-out orifices. 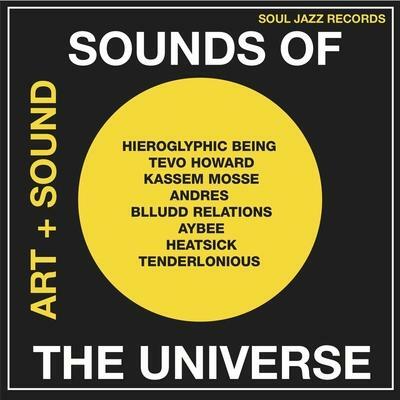 Soul Jazz Records' offshoot label Sounds Of The Universe has spent the past three years releasing a series of 12" singles under the Art + Sound moniker, complete with hand-etched art pieces incorporated into the very grooves containing the sounds. Each release had a limited pressing of 300 copies and were only available from Sounds Of The Universe's London shop. So, much of the music on this outstanding 2CD compilation has only been previously possessed by a few lucky Soho-bound souls. They've partaken in shifting music from garish commodity to its rightful position as a beautiful, desirable and ever so slightly special object. I can imagine these 12" singles removed from their polythene sleeves as darkly glistening alien art treasures. It seems almost a shame to have their contents converted into digital files for global consumption. Although the artwork is reproduced for this release, I can sense I miss something without my being within their sheer physical presence. I long to touch the etched, spiral grooves and feel the musical imprint under my fingertips. Looking at pictures of these objects merely inflames this lust. Anyway, hiding these thoughts away, the music itself scrubs up nicely as a fine cross-section of current international electronica. CD1 compiles a selection from the Art + Sound singles while CD2 contains all-new material. The sounds of the 12" editions are lean, taut and muscular as befits their status as extended groove works. Tracks by Hieroglyphic Being, Kaseem Mosse and Tenderlonious are sinewy rhythm and bone stretched to machine-driven melting point, while Heatsick's 'Snakes & Ladders' thuds and crunches like a multifocal cluster headache. Tevo Howard's 'Summer Romance' and Blludd Relations' 'Cold Like The Baron' both skim along delicate funk surface sheens while maintaining the stripped-down rhythmic approach elsewhere on this disc. Perhaps CD2's all-new material has the edge, simply because the artists are unconstrained by any preconceived notions of what a 12" single should do. Seven Davis Jr's 'Come And Go' and Reginald Omas Mamode IV's 'Rare Love' grumble and mutter disconsolately like sizzling heatstruck tarmac given voice while Golden Teacher's 'Maladroit' sounds quite gloriously as if Billy MacKenzie has been reborn as a 21st century dance diva. Hieroglyphic Being's Jamal Mosse pops up again as part of his Africans With Mainframes duo with Noleian Reusse for the aptly-titled 'Vibrations From the Serengeti II', a deliriously pumped-up blast of African cyber-boogie. Ras G rounds off this second CD with three pieces of delicious lysergically-tinted space jazz. It's doubtful you'll hear a better compilation of contemporary electronic sounds this year. There might be a few owners of original Art & Sound pressings unhappy with their relatively exclusive musical stash being given public dissemination. But music is supposed to be running like water now, and this vintage feels pure and unadulterated, free from contamination by commerce and the dead hands of marketing managers. This is the good stuff.